What does it mean to be funny or to find things funny? And what kind of “funny” are we talking about? Funny – “ha ha” or Funny – strange or odd? All good questions. While we can go with either one, this month’s mandala invites us to focus on the laughter version of funny. On the Mayo Clinic web site, they list the short and long term benefits of laughter as well as providing ways to improve on our sense of humor. The Chopra Center list 6 reasons why laughter is the best medicine. Steve Mazan, comic, shares his view on The Power of Laughter at a recent TED talk. 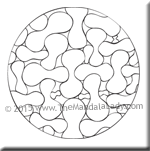 Ponder this and let it tickle our funny bone as we color this month’s mandala. Be sure to check out Section 11 of the 2016 Mandala of the Year.